Senior | January 2006 (approx.) 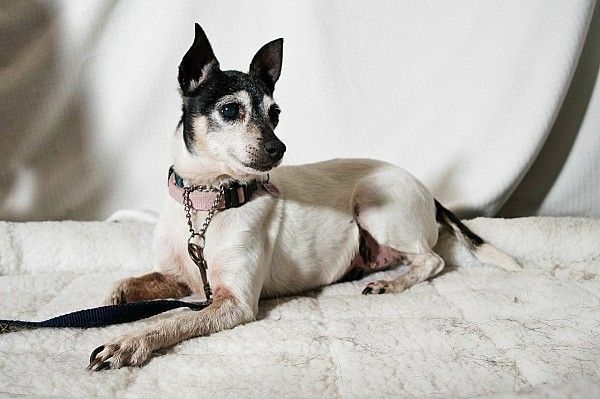 Rat, Toy & Fox Terrier Mix Small | adult weight: 8 lbs Tinker is a sweet old lady who loves a warm comfortable place to snuggle. She will happily climb into your lap if you sit down on the floor with her or jump up to be with you on the couch. She gives air kisses to those she really likes. She loves to go outside and sun herself and enjoys walks too. As for playing, she doesn’t seem to be interested in toys, but occasionally bounces around excitedly and plays with your hand with her paws. She can be shy or startle easily, which means she sometimes shrieks or submissively pees if you move to fast with her. She particularly dislikes being picked up or moved. While you can do both of these if you are slow and gentle, she does much better if you coax her to move on her own. She does fine with other dogs other than the occasional grumble if she feels bothered. She’s also house and crate trained. The Nike Animal Rescue Foundation (NARF) is a non-profit, all volunteer organization founded in 1985 in San Jose, California. NARF is dedicated to protecting dogs and cats. We strive to eliminate animal overpopulation through spay and neuter programs and public education. Our volunteers rescue and shelter cats and dogs in need. We provide medical care and locate quality, permanent homes for these animals. We are also a NO KILL shelter. The animals are fostered in our volunteerâs home; allowing us to give adopters a more complete background about their personality and how they get along with other animals, children, etc. We serve the San Jose Bay Area and have frequent local pet fairs to provide opportunities to meet our cats and dogs in need of their forever homes. First, decide on the kind of dog or cat you want (large, small, active, older, puppy, kitten, long hair, short hair, etc.) and find a few pets that fit your criteria on our web site. Then either contact the foster home directly or visit us at our weekly pet fairs. Next a NARF representative will conduct an interview to make sure that the pet of your choice is a good match. The donation for dogs ranges from $200 â $300, and $120 for cats. This donation covers the cost of spaying or neutering, vaccinations, and microchipping. In some cases, a training contract may be required for our dogs with an additional deposit.